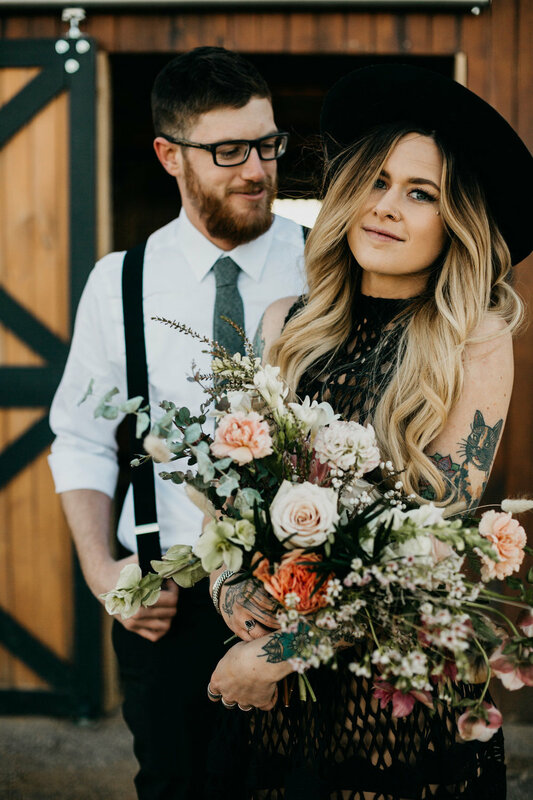 I might be considered biased when it comes to the florist team at Lace + Lilies - our friendship first began when I hired them for my own wedding and they created this beautiful bohemian wedding (and we went Pinterest viral!). However, I think it’s undeniable that this team of babes has captivated the wedding industry. Their wedding floral arrangements are both timeless and trendsetting but more than that, I have seen them go above and beyond in every project that I’ve work along side them. Lacey + Lisa still are two Colorado women-led business owners that I admire most. Below are a few wedding floral tips + tricks from the team at Lace + Lilies! 1. Tell us a little bit about Lace + Lilies and the team behind it! Lace and Lilies is a custom floral design studio, based in Fort Collins, Colorado. It was founded in 2011 by Lisa and Lacey, two midwest girls who's paths crossed because of their love for flowers and spice for life! Lace and Lilies specializes in weddings, large scale events, floral design workshops, and weekly flower subscriptions. The team has grown exponentially over the years, including two very talented full time designers, Hannah and Diane with the most on-top-of-everything Kelly running the office! 2. What's your favorite part of designing florals for weddings? We are so lucky to do what we love, for clients that we absolutely adore. If we had to choose just one thing, it would be dreaming up innovative and creative ideas and making those come to life. There is nothing quite like creating something exceptional with your very own hands. 3. Any trends you're loving this season? Our team has an incredible desire to push the limits and think beyond what you see all the time. For 2019 we are excited to give our clients new ideas to choose from when it comes to their designs. Lets just say we want to see less vases, arches and metals and want to see more garden inspired florals growing on and up from everything! 4. Biggest piece of advice to newly engaged couples? Our greatest advice that we could give our clients is to stay true to you. There are so many outside influences and opinions when planning your wedding and if you always trust your heart, you will always be happy with the outcome! This industry is very fast paced with long hours and weekends spent driving on mountain tops and standing on ladders for hours on end. When we get some rest and relaxation you can usually find us with a cocktail in hand, enjoy our loved ones and embracing all the beautiful things Colorado has to offer! 6. When in the wedding or event planning process would you recommend to start thinking about floral design? We always recommend meeting with your florist, after some of the bigger details and decisions have been made. To give our clients an accurate Lace and Lilies proposal, they will need to have a date and venue booked, a good idea of how many guests will be attending as well as loved ones in their wedding party and sometimes it is even more helpful to have dresses and linens picked out. All of these things work together when choosing flowers and are an important part of our initial consultation. 6months - 1year is perfect! To see more of their beautiful work check out their website or follow them on Instagram!